A special thank you to Peter Purnell for his belief in this project : cover photographs: Barry Peck and Richard Knight : Equipment on cover: Vintage Vox Amplifiers: Mick Grabham's collection; Vintage Marshall Amplifiers: Terry Anthony at Terry's Music, Boston, England; guitars: Mick, Ray and Terry's collections : this Album is dedicated to the memory of our dear friend, Dee Murray. I vividly remember April 1983, as this was the time when I made perhaps the nicest interview in my career as a musical journalist. It was a clear spring day, with sharp sunlight filtering through the dusty windows of my narrow little room situated on the top floor of the Hotel Sinclair in Kensington, West London. Across the table from me was guitarist Mick Grabham, relaxed and friendly, telling me about his involvement with bands like Plastic Penny and Cochise in the late sixties and early seventies. We were, in other words, getting close to my main interest; Procol Harum, whom Grabham had played with from 1972 until 1977. But now he suddenly started to digress and talk enthusiastically about a project I had never heard of before. Luckily, I had kept the cassette with Mick Grabham explaining the story behind this band. In a way the story starts with Nigel Olsson, the drummer in Plastic Penny, he states on the tape. 'After Plastic Penny had broken up I went on to form Cochise and Nigel started playing with the Spencer Davis Group. So through Nigel I met Ray Fenwick, the guitarist with Spencer Davis at that point. and we got on well. He had this plan of forming a 'Guitar Orchestra'. The idea came from an American jazz album, 'Guitars A'Plenty', released in 1962 by the George Barnes Guitar Choir, an ensemble who utilised the 'guitars in harmony' style to its – then – limits. And we started thinking about how the same sort of idea could be done in a rock music setting. Initially, the plan was to form a band to take on the road – a band with no less than four guitarists in the line-up. In fact, Tony Newman had played with several influential bands since his time with Sounds Incorporated (an early to mid-sixties instrumental group managed by Brian Epstein); his latest engagement before joining The Guitar Orchestra had been with May Blitz. During the interview I can hear myself asking Mick Grabham if it would be correct to describe the whole project as 'two guitar freaks trying to find out just how many guitars you can get away with putting on a record'. He bursts out laughing. The big question is, of course, why on earth the group's self-titled album never got released at the time. It was all recorded, produced, mixed down to master tape (by Fenwick and Grabham themselves), all ready to go straight to the pressing plant. More than ten years down the line from my interview, and almost twenty-five years. after the album was 'shelved', I'm happy to find Grabham just as enthusiastic about The Guitar Orchestra as ever. The same could easily be said of his old brother-in-arms, the notorious Ray Fenwick. Like Mick Grabham, Fenwick has a long and impressive pedigree, not just on the British music scene but in European rock as well. In the mid-sixties he played with the now legendary UK freakbeat group the Syndicats. He then crossed the Channel to team up with Dutch psychedelic heroes the Tee Set (in a later incarnation known as After Tea). 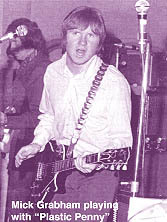 On returning to his mother country in 1967, Fenwick joined the post Stevie Winwood version of the Spencer Davis Group, and later the Ian Gillan Band. Recently, Ray has finally been up for some of the recognition he so rightly deserves, his past efforts finding their way on to a number of CD issues. The Guitar Orchestra can be seen as yet another link in that chain. 'I never forgot that album,' Fenwick states. 'It was always in the back of my mind for all these years. Even if you don't listen to the guitars – though I admit they would be difficult to distract from – it was an interesting combination of people. The actual recording sessions were a lot of fun; don't forget we were real good friends and had worked together a lot. In retrospect, we were really lucky to have Dee involved as, at the time, he was so busy with Elton John, who was fast approaching megastardom. Also we couldn't have imagined the status that Tim Renwick would later achieve playing with Pink Floyd, Eric Clapton, et al. And Tony Newman was always such a fantastic drummer. I don't think anyone who's seen it could forget Tony's amazing drum solo as part of Sounds Incorporated as they supported the Beatles in the Shea Stadium concert film. He's now a session player living in Nashville, currently playing with the Everly Brothers. 'Recently, Mick and I were able to resolve our copyright problems when Elgar's works came into the public domain. Consequently, after all these years the album was up and rolling again. But the album The Guitar Orchestra is much more than just one piece written by Elgar (full title: March No. 1 in D Major, Opus 39). It also includes a whole string of songs penned by Grabham and Fenwick, covering a number of different styles, from typical early seventies blues and West Coast vocal harmony-based arrangements, to little guitar vignettes linking the different parts of the album together. There is a lot of versatility on display here, a lot of emotional and technical ability, too – all garnished with a sound so unmistakably 'early seventies', so dry and tight that one can almost feel the carpeted walls inside Tony Newman's 'drum booth' (a seventies studio invention equivalent with solitary confinement, now banned by Amnesty International). So now we know how Pomp got rejected. But why did the rest of the album have to go with it? Though it's a somewhat bitty album, there's much to interest the committed Procoholic in this typically attractive offering from Angel Air. 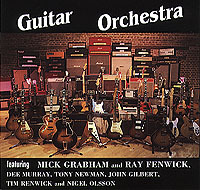 The first and last tracks on The Guitar Orchestra present Mick Grabham in the sort of symphonic settings to which he contributed so much with the latter-day Procol Harum ( see here), and the intervening tracks and doodles present a great variety of guitar sounds and techniques that throw Mick's only Harum composition, the straightforward Mark Of The Claw, into intriguing relief. The undoubted highlight is the Elgar. From the opening, vigorous assault, its ensemble playing and deft arrangement are continuously thrilling. Fans of Procol Harum's Blue Danube treatment will be delighted and impressed by the care and subtlety with which Grabham and Fenwick have re-crafted this famous March from its orchestral incarnation into an extended piece for rock band. The Procol comparison would not occur immediately to anyone who did not know Mick's history, however: here there's a lightness of texture (no piano, no organ) and a mischievously Hawaiian feel to some of the guitar harmonies (I can imagine Albert Hall purists quailing at these) that lie a long way from what Sam Cameron has called Gary Brooker's 'stately-home' tendencies. That relative transparency allows us a very clear view of the drummer – fans of the unexpected and elaborate fill will not be disappointed – and bass-player, the enviably nimble Dee Murray, who went on to join Procol Harum for their last tour with Mick. It also places a terrific burden on the thickly-layered guitar chorus, which takes full responsibility for the dynamic variation that – alongside the stirring melody – gives the piece its dramatic effect. When the Big Tune emerges, still and stately, after two-and-a-half minutes' frenzy, one perhaps longs to hear a smidgeon of celestial smithery behind the exposed solo guitar: but once the tune is reprised, the dense guitar harmonies would make any keyboard padding redundant. Anyway they wanted to be a Guitar Orchestra, and that brief was admirably fulfilled: what I like best is the way the band maintains a real orchestral elasticity of pace – it's a genuinely musical interpretation of the piece, which sweeps aside any accusation of gimmickry in its conception. Misguided Woman is a return to the 70s rock style, with echoing heavy vocal ruing the theft of 'the best part of my years'. Words such as 'The woman is so evil ...' don't rise much above the generic, which is a pity because there's real drama in the chords and tension in the drumming. The guitars break out and spar excitingly after a while: then there's an extended section for guitar, with further unexpected moments, before the vocal comes back. This is certainly a song that – at over six minutes – would have performed well live. Its strange final moments take us momentarily into the world of Robin Trower's Song for a Dreamer. Lost Weekend starts off spare and moody, with some interestingly academic touches in the way one group of guitars echoes another. After a couple of minutes, however, we seem to be listening to the backing track for a vocal that never arrives: intricate, always attractive to the ear, but unfulfilling. More guitars chop in, high up the neck, and drums and bass whip up a gathering tension ... only to relax again into the sparser material of the opening, with a maddening little descending figure knitting it all together fluently. It's long, perhaps it's inconsequential, but you're singing the riff to yourself an hour later. Ghost Town is the third track in a row to weigh in at over six minutes: in fact it's well over seven. It lays out its wares slowly and enticingly, high guitars and occasional harmonics over a steady picked motif. This time I'm expecting to hear the wonderful Richard Thompson groan some harrowing ballad of faithlessness and despair ... and when the track suddenly gets heavy that expectation is confirmed. Yet Nigel Olsson's vocal takes a wholly unexpected direction, reminiscent of CSNY, and the words concern 'a six-gun hanging at your side, the only law to know.' Somehow this vocal style doesn't sound so dated: perhaps the spooky subject has more gravity and distinction than the earlier lyrical offering. Within a chorus or two, however, we seem to be listening to something rather Stones-like, while a trace of Wishbone Ash hangs in the air. Yet, though these disparate ingredients seem to be tacked together end-to-end, the variety isn't in the least irritating: a sudden fade ushers in a reflective, freer passage with highlighted snare drum, and we feel we're in the midst of an evocative film-soundtrack. Stella is economical in a way that the foregoing trio of tracks are not: this is a gently wandering number, valuing atmosphere above melody, and ending just when you expect more! Live Wire, as the name might seem to suggest, would have come over well at college gigs in the 70s, specially to someone who, like me, was interested in the way a bass-player could propel a band. I can't work out who's playing the different guitar parts – this is the only way in which the otherwise excellent documentation of the CD might conceivably be improved – but Mick or Ray – or Tim Renwick – is having a bit of fun not-quite-quoting from the Beatles' Get Back here and there. This is another item that really seems to deserve a vocal track. Last Chicken in the Shop starts with a few chops which could perhaps be distant ancestors of the opening of The Unquiet Zone: it's another number of episodic construction, and features the return of a tight-trousered vocal from John Gilbert: but this isn't given long in the spotlight before the band tears into a frantic boogie playout, mostly on one chord, but increasingly unpredictable in its accentuation. Camp Town is just under a minute of the familiar Camp Town Races by any other name, and it's played delicate and straight by guitars on their own, sans bass, sans drums, sans everything. Suddenly we're at the last track, seven minutes of weighty, strong playing and disciplined, tensely-controlled harmonic interest. There's a Procoloid flavour – though remember these are pre-Harum days for Mick Grabham, the composer – in the way a sequence of diminished chords climbs, shifts and resolves: Brooker achieves something like this in All This and More, though that song has more of a sense of closure about it than the present piece. Something of this nature can also be heard in some of the bridging passages on the long suite on Abbey Road: here, though, the bridge is all, hanging in the air between promontories that our imagination has to construct for itself. It's a strong closer to a rather patchy album – as Mick Grabham freely admits in conversation – in which more attention has been given to the trees than to the wood. But fans of tasteful detail will enjoy every minute of it: and fans of overdubbing will be mightily impressed. The glorious Elgar treatment was always going to stand out like a cuckoo among its lowlier fledgling companions: as Claes Johansen's liner note suggests, its place in history might have been very different had it come out, timely, ahead of its time. But it didn't, and we can't turn back the page: let's simply thank the folks at Angel Air, and Messrs Grabham and Fenwick, for making it available to us now.